The Agilent 5359A time synthesizer produces two extremely precise low-jitter time delays. These delays, Td and Tw, are individually selectable from the keyboard. Step values of 50 ps or greater set these delays at up to 160 ms. 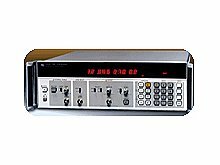 The 5359A serves as an important tool for the calibration of radar, Loran, DME, and Tacan systems, for precision generation of delayed sweeps in oscilloscopes, and for extremely accurate time positioning control of external gates on frequency counters. It can also be used for accurate delay line simulation in component and circuit test applications. Automatic calibration: The calibrate control allows simple calibration immediately before the generation of a precise delay. Only 3 seconds are needed to calibrate 5 internal parameters for temperature compensation and aging effects. Easy-to-use: Widths, delays, frequency, period, and step size may all be selected at the touch of a button. Continuously depressing "step up" or "step down" generates a convenient "sweep" of different delays or widths. Flexible output: Positive or negative polarity is selectable, and true or complement modes allow the logic sense to be changed.